Romantic holiday-rental apartment in restored Tuscan farmhouse on the rolling hills of Chianti, with shared pool, private garden, parking, cotton floors and wooded beams. Cellar, kitchen, living room with fire-place and sofa bed, 3 bedrooms, 2 bathrooms. There are other 6 apartments in the farmhouse but you have your own private garden. New furniture, equipped kitchen, bathroom towels and bedroom linens are provided once a week. Bedspreads are 100% cotton and made by the main Italian brand, we use only quality fabrics. Sleeps 4 to 7 people. The apartment has been restored recently and has new furniture and equipment. No need of A/C because it's well insulated and on top of a hill surrounded only by vineyards. 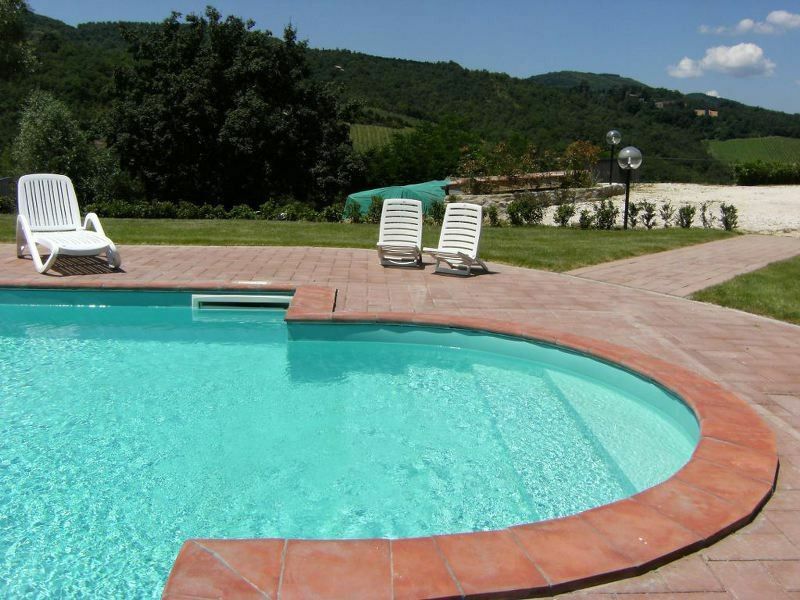 Close to Florence, Siena, Golf course club only at 20 minutes drive. Description : apartment is on 2 levels, with private garden, 3 bedrooms and 2 bathrooms, kitchen, living room, a large double bedroom in the attic with a nice sky-light. The kitchen is equipped with usual Italian cooking stuff, coffee mocha machine, etc..
Also in the garden there are olive trees, cypresses, fruit trees and laurel all around the gardens. So you can be sure that you will breathe only pure and clean air and you will have all the right furniture and facilities to enjoy your time in the private garden and by the shared pool. The property is surrounded by the vineyards of a famous and good wine producer company where you can go and taste their best bottles. Assistance: You can email us any time, we'll be happy to answer to your questions and to help you with any kind of assistance you might need. Activities: ----Bike rentals available with home delivery. Driver service and pick-up at airport on request. The 41st EXPO is the ideal opportunity to get to know Chianti Classico Wine in the very region that bears its name. During these days, Greve in Chianti will offer visitors a full program of artistic and cultural life, as well as the possibility of visiting the cellars and wineries. getting to know the world of Chianti wine. Horse-back riding tours, 20 Euro per hour per person. Fashion designer outlets at only 20 Min drive, great for a week-end of shopping! Bathroom towels and linens once a week. Extra cleaning available on request. There is no central air-conditioning. Usually there is no need of A/C because the apartments are on a hill at 300 metres and are also well insulated. This is only a holiday home rental, there is no breakfast nor internet supplied and no TV. If you need internet there is a free wi-fi café at 15 mins from here. Cooking classes available on site. Bike rentals available with home delivery. Any kind of extra service can be requested at relative cost and booked before arrival. Accueil chaleureux de Giovanni. Bel appartement très spacieux dans une vieille maison toscane fraîche malgré la chaleur. Le calme dans les vignes du Chianti. Avec le train tout proche (et parking gratuit), pour se rendre à Florence. Parfait. Le site et la maison sont encore mieux que la présentation. Belle surprise. Grazie per essere stati miei graditi ospiti-spero di rivedervi. Agréable maison avec double exposition et très fraîche. Pièces très spacieuses, literies confortables, ensemble très propre. Accueil très chaleureux et grande disponibilité du propriétaire. Un très agréable séjour à la Capanne au coeur de la campagne toscane avec nos deux enfants de 13 et 8 ans. La maison est très agréable avec petit jardin et piscine pour se rafraîchir apres des journées de visite dans les 3 perles TOSCANE ( Sienne, Florence San Giminianno). Notre hôte Giovanni nous a chaleureusement accueilli et prodigué ses meilleurs conseils, adresses. Nous nous sommes régalés et sommes prêts à revenir l'année prochaine dans cette merveilleuse région. Ein wunderschönes und sehr gepflegtes Ferienhaus, mit ausreichend Schlafmöglichkeiten, grossem Wohn-Esszimmer, 2 schönen Terassen und einem netten Pool. Die Gegend ist traumhaft schön. Der Vermieter ist sehr sympathisch und hilfsbereit. Gerne wären wir in diesem Jahr wieder gekommen, doch haben sich die Preise im selben Reisezeitraum mehr als verdoppelt -Schade!!! we are pleased to learn that you have enjoyed your stay at our property, and at the same time we would like to inform you that the rates are in line with those offered in the market for such a kind of apartment, Also the comparison you have made without providing speciifc information, it doesn't help us to verify thoroughly. Please let me know exactly the dates you have planned for your stay and how many people you are in order to check and let you know. Formidable séjour dans le chianti et en toscane grâce à l'acceuil que nous avons eu a la Capanne. Les lieux sont irréprochables, les propriétaires sont disponibles et n'hésitez pas à leur demander quelques conseils de visites( Florence, Sienne, Greve, Panzano, etc..) et surtout les bonnes adresses dans les alentours de dudda. Pour terminer le cadre est magnifique et le paysage grandiose. De locatie is prachtig, het appartement schoon, goede bedden en een huurbaas die het je naar de zin wilt maken. Spreekt helaas alleen maar Italiaans. Zoek je veel vertier dan moet je hier niet zijn, het is toch wel ruim een half uur rijden voordat je bij Greve bent. De foto's op de site geven een goed beeld van het huis, intichting en omgeving. Area of Greve in Chianti. Golf facilities are nearnearby aswell wine and olive oil producers and tasting, Tuscan food restaurants and fashion outlets nearby The house is close Siena, Arezzo, Florence, Pisa, San Gimignano, Certaldo, Impruneta, Strada in Chianti, Cintoia, San Polo in Chianti, Radda. Golf: 18 holes green on the Tuscan landscape, only 20 minutes drive from the property, ask us for more and updated info and contacts. You will get special discounted rates at the Golf Club if you are our clients. Contact us for more updated info and prices. Please note: All prices are intended per apartmen From September until May any gas consumption expense will be charged separately. € 5,00 mc.